Why are kitchen upgrades such popular home renovation options? 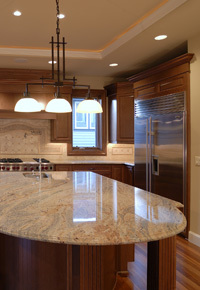 The main reasons kitchen remodels are so popular, particularly in a sluggish economy, are both financially fueled. The trend toward people cooking and eating at home is, in large part, due to the lower cost. The more time you plan to spend in a room, the more renovating it makes sense. Especially when homeowners are highly likely to get back a high percentage of what they put into such projects. Year after year, kitchen renovations are some of the best performing projects on Remodeling Magazine’s often-cited Cost vs. Value reports. 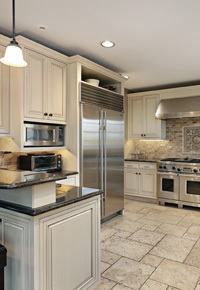 According to the 2011-2012 report, major kitchen remodels are at 65.7%, while minor kitchen remodels earn an amazing 72.1%. In order to optimize the return on your investment, make sure your cost lines up with your home’s value (as depressing as that number may be). A good rule of thumb to help you avoid over-doing it is to set the high end of your budget at 15% of your home’s value. Since that amount typically won’t add up to the $50,000+ needed for a full kitchen remodel, the minor kitchen remodel that costs under $20,000 is more sensible for many. A major aspect of the kitchen face-lift is the cabinets. 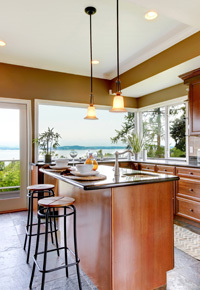 Furniture-grade cabinetry in kitchens is a design element that seems to transcend style choices. From traditional to shaker and contemporary designs, the aim is to help your décor flow seamlessly from your other living spaces to your kitchen. In today’s open concept home style architecture, the kitchen is viewable from other areas, anyway, so this idea makes sense. Another consideration with open designs is the lack of upper cabinetry. (If you take out a wall, only to hang cabinets from the ceiling, what’s the point?) Instead, tall cabinets can end a bank of base cabinets, providing a visual anchor while adding extra storage. An extension of furniture-grade cabinetry is what’s being called integrated appliances. As much as that stainless steel refrigerator is preferable to a giant white box, masking it with panels that look just like cabinets is ideal, for most homeowners. Dishwashers can also acquire furniture-like appearances. Dishwashing drawers have also gained popularity, as have warming and cooling drawers. Appliance garages to hide microwaves and other countertop items are on the decline this year, but they’re still around. Cherry and maple are still the two species-of-choice, but maple has taken cherry’s long-held top position, and wood-finished cabinets are still the most often type purchased; in 2002, they represented 80%. Of course, a main part of your cabinet choice has to do with design and finish. Light natural, dark natural, and colored painted finishes are on the rise, while glazed, medium natural, and white painted finishes are on the decline. Distressed finishes are also dropping in popularity, according to some. Traditional style is still on top, followed by shaker style, while contemporary is slightly less common than it was previous years. Photo credits: Top © Larry Malvin Photography / Fotolia. Middle © Iriana Shiyan / Fotolia. Bottom © Harry HU / Fotolia. If you are looking for a full service commercial or residential construction company in the Maryland, Washington, D.C., or Fairfax County, Virginia region, we'd love to have the opportunity to learn about your construction project and give you a free quote. Submit our online contact form or call Don Hartman at (301) 926-9000.